In this article I explain how I learned, and how I still learn photography in a self-taught way. Hopefully it will be useful to all aspiring photographers. As I have already mentioned in some interviews, I fell into photography by accident. In 2010, while Spry photograph the first collection of “KhaciJay”, he advises me to get a camera. This way, I will be able to realize my ideas precisely on my own when he is not available. I have therefore acquired a Canon EOS 500D. The beast in my hands, never having been very interested in the shooting, I found myself a little lost. Spry explained the basic functions to me and then advised me to read the booklet that comes with the device. So I read it. In full. Yes yes, the mini-book, written very small, with technical terms, and without images. It doesn’t make you dream, but its reading is essential to understand how our camera works, even if at first you don’t understand everything. At the same time as I was reading it, I was testing the functions on my camera. From then on, I started shooting at everything, everything I could, wherever I could. The practice is essential. Few months later, I went on a trip with a friend, not a photographer, but who had an eye. He taught me the basic rules of framing, then every new street, every new landscape was an opportunity to practice. Further on, many discussions with photographer friends allowed me to learn more and more: Enock, Alexis Goudeau>, Shawny Ocho, Carlos Guerra>, Céline Sarr, Darwin Doleyres, Arnaud Tudoret>. Whenever the opportunity arose and I met other photographers, I would ask them for advice. Of course, we often take rejections, but it’s worth a try. Always try. When I felt that I had reached a level, I bought the book “Mastering the Canon EOS 500D” from Vincent Luc, which taught me a lot. Then I changed cameras, Canon EOS 7D, then Canon EOS 6D, and I proceeded in the same way each time: reading the booklet, then reading a book dedicated to the camera. Little by little, I read other books, magazines, according to what I found, according to my needs. In 2012, I was asked to photograph a wedding. My first. I didn’t know anything about it, so I had a month to learn. I went through a lot of forums, watched videos on Youtube, and bought books like “Le Mariage, Reportage Photo” by Thierry Gonzalez, the wedding special issues, 5 and 17 of the magazine “Compétence Photo”. 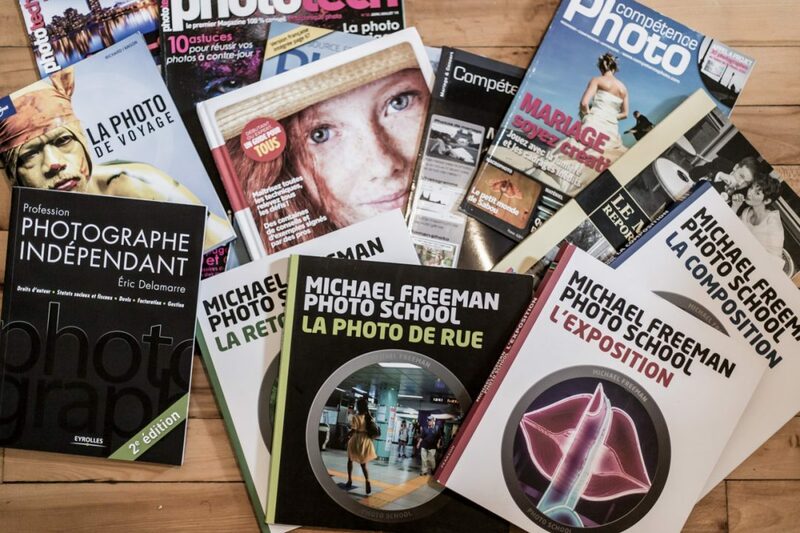 Today, my photo library has the following books: “Photo Portrait, Le Guide Pratique” from the Eyrolles group, “La Photo de Voyage” from Richard I’Anson, Michael Freeman’s excellent “Photo School” collection with “L’Exposition”, “La Composition”, “La Photo de Rue”, “La Retouche”, “A beautiful anarchy”, “The visual toolbook – 60 lessons for stronger photographs” and “Within the frame – The journey of photographic vision” by David duChemin, and I regularly buy the magazines “Phototech” and “Photonews”. Not to mention the art books of well-known and lesser-known photographers, to be consulted without moderation, as well as the renowned magazines on fashion (Vogue), travel (National Geographic, travel guides)… Basically, any book that publishes quality photos of your domain in order to understand what makes a photo interesting. The Youtube channels I watch regularly are as follows: Le Studio de Poche, Chris Burkard Studio, Cineastuces, F/1.4 – À pleine ouverture, Apprendre la Photo, Lozeau, Craft & Vision. I also watch the backstage videos of the big shootings, sometimes online, to see the equipment and get an overview of the shooting process. Finally, for the administrative part, the one that enchants everyone, huh?! But it’s important, folks! I based myself on the book “Profession : Photographe Indépendant” by Éric Delamarre, very complete and informative. In 2012, I followed two internships: one of several months at the Just Winner studio, and a 3-hour internship with the photographer Little Shao. All this makes it possible to learn and/or confirm certain practices learned alone, to meet other photographers, and possibly future clients. Enrolling in portfolio readings is also a good approach to evolve and improve. The more cheap version are facebook groups for example, where you can ask other photographers for their opinion on your photos. Criticism – constructive, we agree – is essential to take a step back from one’s work and to be able to evolve in one’s creations. Previous articlePhotography | Copyright and image rightsNext article "Where do your ideas, your creativity come from?"